If a picture is worth many words, one glance at the cakes made by Linda Brudz at Sweet Alternatives may make it clear why I was so quickly taken with her artistry. (For that reason, all photos on this post are from Sweet Alternatives. I could never do justice with my lack of photographic ability!) We met at a community event and exchanged cards. When I looked at her website, I was impressed by the beauty of her cakes and her training as a pastry chef. I wasn’t the only one that was struck by her ability: one of her cakes is currently featured on the cover of Boston Weddings magazine! Especially for foodies, the taste of a cake is as important as how it looks. Linda was kind enough to make my family and friends a range of samples to taste. Our egg-allergic children loved her vegan cupcakes. The adults loved the whimsical taste of the rootbeer frosting! She also made us a sweet dulce de leche filled chocolate cake with chocolate buttercream. My favorite was the gorgeous and moist lemon cake. It was filled with a lemon-cream cheese buttercream, as well as fresh raspberries and blueberries. I have high standards for lemon cakes, and this one was delicious. In fact, each friend who was lucky enough to come over while it was still around agreed. 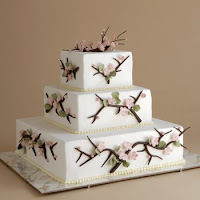 Linda makes a wide range of cakes, so you will have to e-mail her to get the full list. 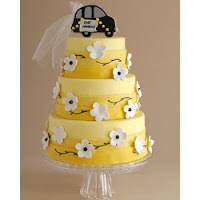 But some examples of her regular cakes include (in addition to the standard yellow, white and chocolate) champagne spongecake, hazelnut, white chocolate, and carrot. She also makes many fillings from mango mousse to lime curd or whoopee pie cream! And, in addition to the root beer cream you can enjoy her buttercreams in flavors such as lime, almond and white chocolate. One of her most popular combinations is champagne cake with strawberry mousse and vanilla buttercream. Most importantly, she will work with clients to create a unique look. It is always a thrill to feature local people doing great things. Linda Brudz, of Sweet Alternatives, is one of those people.